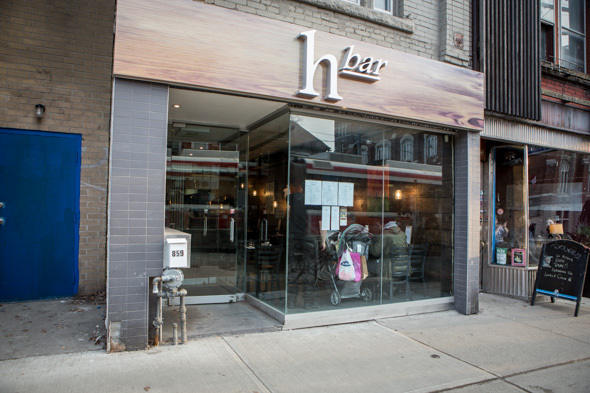 H Bar just opened on West Queen West in the space formerly occupied by Sweet Lulu . The eatery is a joint project by Kate Hancock and Phil Hubbard, two food-industry vets and former co-workers, who wanted to create a spot that fulfilled all their requirements for the ultimate restaurant: Locally-focused ingredients, a homey atmosphere, good customer service, and recipes with plenty of heart. 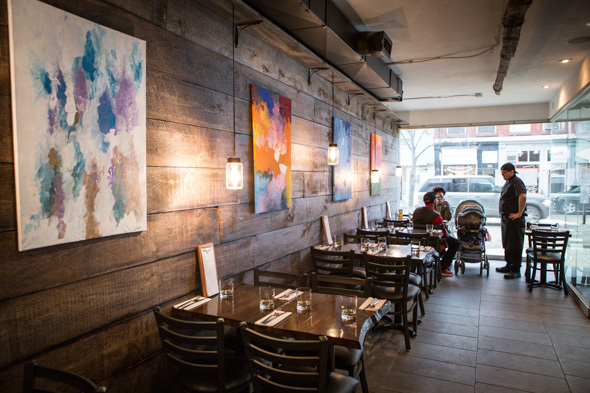 The new owners kept the noodle bar's modern interior, but did away with the wall-lining benches and added cozy tables to the small downstairs dining area. Upstairs, in the "sportsbar" area, there's a large TV and a long bar where you can enjoy a cocktail and a chat. The menu is Hubbard's baby; he explains the great care put into the subtleties of each dish, from mixing coleslaw to order to marinading and smoking their goat cheddar. 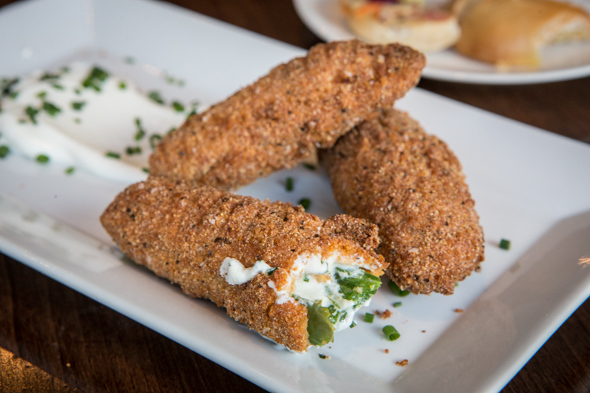 They use hormone-free meats, and nearly everything is made in-house. That handmade ethos even extends to the buns on the sliders ($12.39), which come in chicken, beef, bison and veggie iterations; you can order three of the same type or mix and match. The beef (made from a mix of brisket, chuck and sirloin for extra flavour and moisture) is a standout, as are the accompanying gaufrette fries, which come with a sweet maple aioli for dipping. The buns, however, trip me up - they're tooth-stickingly dense, and I don't love the pastelike texture of the walnut, bean and mushroom veggie patty. 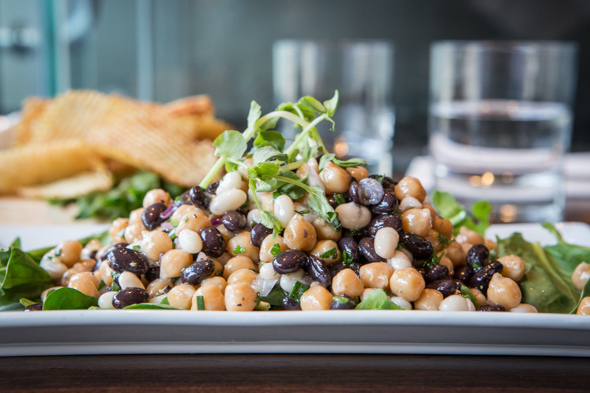 Bean salad ($7.08) is a lighter lunchtime option; White, black and garbanzo beans come accented by olive oil, pickled onions, fresh herbs, salt and pepper. It's the kind of thing you'd make at home: simple, light and satisfying, though I would have liked to see a heavier hand with the salt and vinegar. 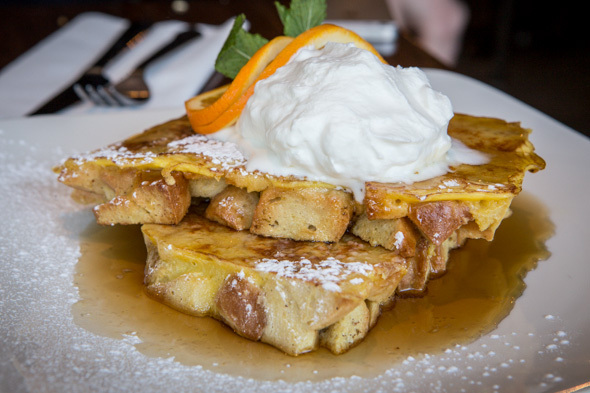 If you stop by on weekends, they'll have the brunch menu on. Hubbard's pick is their French toast ($7.96), made from leftover buns ("we don't like to waste anything," he explains). Even after being dredged in vanilla custard, the bread is still pretty heavy - only this time, you can give each piece a twirl through Hubbard's glorious bourbon maple syrup (you can really taste the bourbon) and a healthy amount of whipped cream. 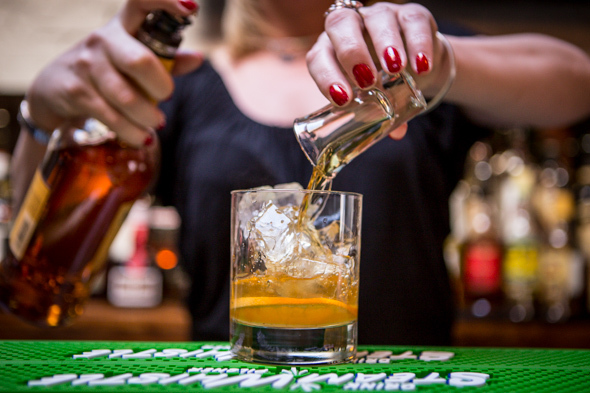 Their all-handmade-everything approach even extends to the cocktails menu, where they make the bitters, cure the cherries, and mix up the vanilla sugar in their Old Fashioned ($9.73). 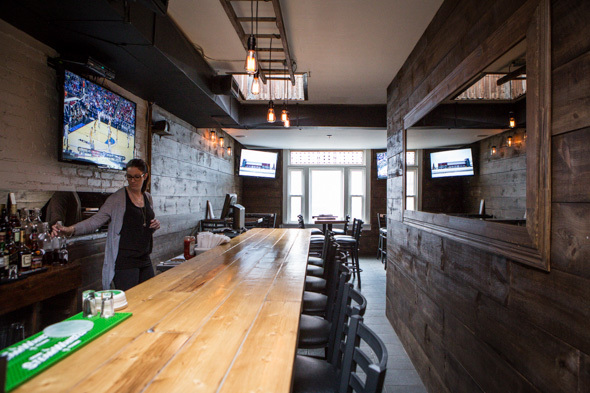 They try to keep the beer offerings local as well, with a long bottles list that shows some impressive scope (there's Amsterdam Blood Orange Radler, Junction Conductor's Ale, and Brickworks 1904 Cider, among a couple dozen others). Though the kitchen may still be carving a niche for itself, it's great to see pub classics done with great care and a clear creative drive, pushing homey recipes to interesting new places. I'll be back to see how the menu evolves (and figure out how many dishes I can smother in bourbon syrup).